The story of BCC Water Network began in November 2006 when co-founders Janaki Jayanthan and Trevor Hirsche arrived in the town of Ascension de Guarayos, Bolivia. Having been recently trained by CAWST (Centre for Affordable Water and Sanitation Technology), they were in Bolivia to volunteer with the pilot BioSand Filter project of a small water and sanitation organization. After a few months in the town, it became apparent that the organization would not be able to complete the pilot project due to financial difficulties. Having personally seen the tremendous need for the BioSand filters in Ascension and surrounding rural areas, the Canadian volunteers teamed up with two Bolivian employees to continue their work apart from the initial organization. With the support of a local Pastor, who had been involved with the pilot project since its inception, they were able to sign a deal with the municipal government providing them with free transportation for their filters and the use of a work site. This agreement with the municipal government, signed on February 28, 2007, marked the beginning of COBAGUAL, which grew to include four Bolivian employees over the next several months. 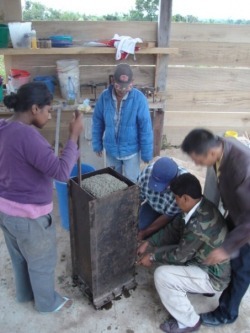 Shortly after COBAGUAL installed its first 25 successful filters, the Canadian volunteers returned home to look for paid work and continued to collaborate with COBAGUAL. Realizing that COBAGUAL was not the only community-based water and sanitation in Bolivia, and not wanting to 're-invent the wheel', they teamed up with a volunteer Board of Directors forming BCC Water Network to support other small, Bolivian-run groups in their work to improve the quality and quantity of water available in rural Bolivia. The summer of 2008 brought a couple of important changes to BCC Water Network. The first development was that, BCC Water Network delegated more administrative responsibilities to employees of COBAGUAL – allowing it to operate as an autonomous organization. Secondly, Trevor and Janaki had the opportunity to visit Oruro and see several of Jaraña's projects first-hand. Impressed by the level of community involvement, and innovative approaches to using water to improve agriculture in a very inhospitable environment, BCC Water Network decided that Jaraña would be an ideal second member organization of BCC Water Network. Since 2008 several other Canadian and Australian volunteers have taken the time to volunteer for us in Bolivia - providing our member organizations with new perspectives on ways to improve their projects and providing our board of directors with reporting.